I was recently turned onto TweetGlide after watching an episode of the Joel Comm Show with his first guest, Mike Filsaime. TweetGlide is similar to many other Twitter apps, which separates your tweets, direct messages, mentions and searches into several organized columns, which are called Glide Columns. The difference between TweetGlide and its very similar looking competitor, TweetDeck, is that TweetGlide was made by Internet marketers for Internet marketers. That means that with every tweet you post, you earn credits and use towards free advertising to the TweetGlide community. You can also make money by referring others to TweetGlide. While the application is free, you can upgrade to a Premiere version, which will increase your limit of 140 characters to way more so you can post an ad using the credits you’ve accumulated. Your ad can be seen by hundreds of thousands of users in the Twitter universe depending on how many times you tweet and the amount of credits you earn. Many people complain about not liking change, or getting used to a different application interface whenever something new comes along. 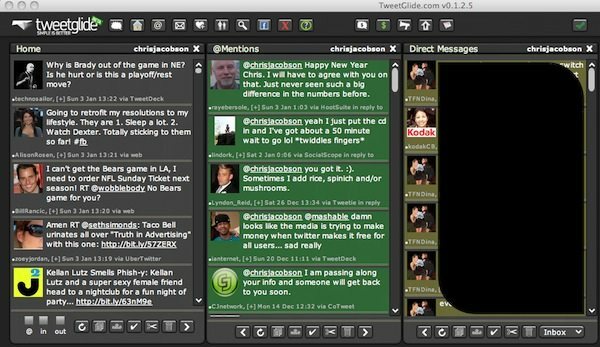 I’ll admit that I’m the same way, but when I tried TweetGlide, I was amazed at how similar it looked to other applications. Here’s a preview of my setup with only three columns, but you can add many more depending on your needs. When you tell people about TweetGlide, using your referral link, they will download and then install TweetGlide on their computer. During this process, there is an offer for a Premier Upgrade for $97. If they purchase, you make a 50% commission ($48.50)! Besides having the app available for PC and Mac, the developers are working on an iPhone app, which will be very useful if you like to tweet on the go.